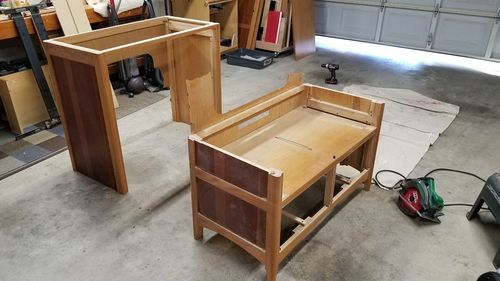 My oldest son knows that I like to take old furniture apart and salvage what I can for future wood working projects. 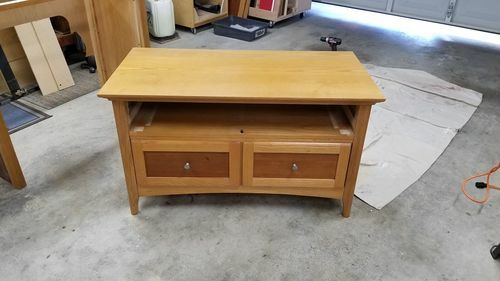 He had an old second hand entertainment center that was too small to hold a big flat screen TV so he asked if I would like to have it. After I took the doors off, removed all the hardware, and slid out the drawers, I had an idea……….. 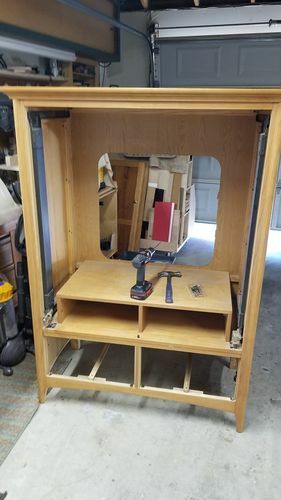 So I removed the top and the interior shelf…..
And just cut that baby right in half! I then set the top back on and slid the drawers back in and took this picture to send to him. He immediately responded with his approval! 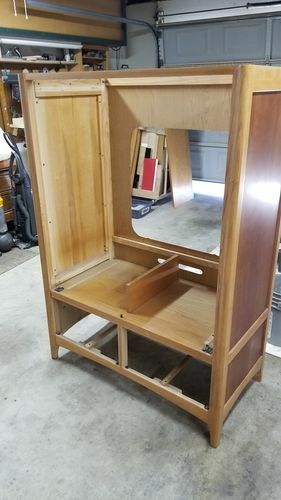 There are still some spots that will require some finish to be applied and I have to come up with a way to attach the top, but for the most part, it’s done. Now he doesn’t have to buy a new stand for the TV and I still have some salvaged wood for my ever growing collection. And, I had a lot of fun doing it! As big screen might be heavy, I would place a divider in the middle again to prevent sagging of the top . Looks good! Kept it out of the landfill and you got some goodies too. There is actually a divider that goes there. I just didn’t attach it when I took the picture. There is also a rail that runs the length of the front that is not shown. The top is almost 2” thick. I stood on it and it hardly moved. This thing is a beast. It took 4 of us to unload it from the truck. 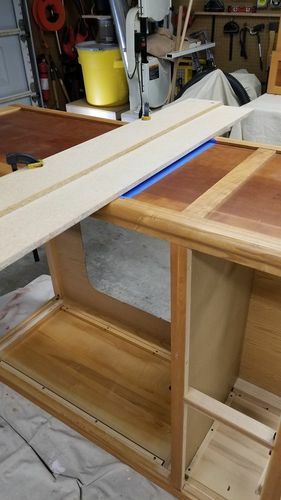 Excellent idea on making use of what you had/ have to get the results you wanted…..On attaching the top (from the pictures you posted), I’d use figure 8’s…..all the away around it, if the sides are at least 3/4” thick or thicker…I use them all the time to attach tops to things like sofa tables, end tables, etc. Just take a 3/4” Forstner bit and drill down about 1/8” and attach them to the rails and legs….Turn it upside down, center the top on the unit, and attach the other half of the figure 8’s to the top….If you don’t know what figure 8”s are, Google them, or look at Woodworkers Supply or other supply places….Hope this helps with your situation….Easy peasy..nice and easy…!! NOTE: When you Google up figure 8’s, it’ll show images on how to attach them to the frame and top….!! Chem , nice job and congratulations on your ‘Daily Top 3’ award. Chem , nice job and congratulations on your Daily Top 3 award. You gave it a new life ! Quite the transformation. Well done !